We are ideally located on the outskirts of the historic town of Cashel, Co Tipperary. Not only is Aulber House located within a classically designed garden of just over 1 acre on the western edge of Cashel, we are within easy walking distance of the world famous Rock of Cashel! Also within walking distance is Hore Abbey, a 13th centuary Cistercian Abbey (now in ruins but well worth a visit!). We offer full bed & breakfast facilities and have 12 luxuriously appointed bedrooms for guest use. Each spacious room is furnished and equipped to the highest standard and features en-suite bathroom facilities, power shower, direct-dial telephone, remote control digital television with Sky TV channels, hair drier and tea/coffee making facilities. 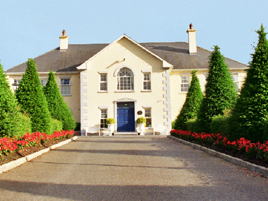 Aulber House is a non-smoking B&B.Aulber House is an fantastic place to stay if you wish to discover the beautiful attractions that County Tipperay has to offer, as we are central to all of the other major towns and villages including Clonmel, Thurles, Cahir, Nenagh and Holycross.